That is killer. Downloading the latest PP now. Thanks man. Hi – I have Adobe Premiere Pro CC 7.2.2 (build 33) but this preset isn’t in the list – I’m using the version provided by my Adobe Creative Cloud subscription. Can you say what version and build you’re using? Thanks. Make sure you are using “Premiere Pro CC 2014”. The CC 2014 release gets installed along side of the original CC release. The plugin is not available inside the older version. The 2014.0.1 (latest) version is 8.0.1 (21) Build. Hi Andrew – just after I posted that question I noticed that my icon was still linked to the old version, even though CC 2014 was installed already. Problem solved – thanks for responding. Great tip! What about correcting still shots for large format printing? Would you mind posting the curvature numbers for all the presets? For those of us on CS6? There are 35 of them – can you be more specific about which one(s) you want curvature info for? Right now I’m interested in the GoPro 3+ Blac. These numbers are available nowhere on the internet. I could guess, but the presets are probably more accurate. One of my cameras is always on 1080 SuperView but I always find the 1080 Wide preset works best. 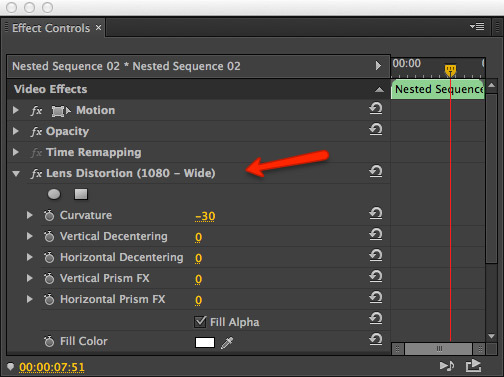 The 1080 SuperView curvature setting seems seems excessive, to me. YMMV, though. 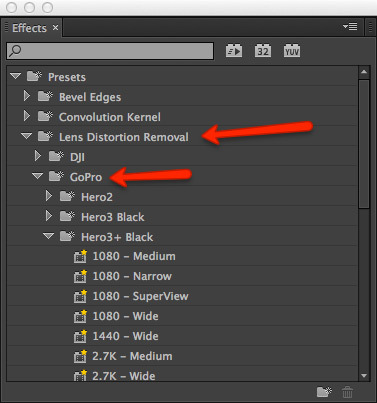 FYI, the latest update for Premiere Pro CC (2014) doesn’t have any presets for the Hero4 so I assume they’re either the same as the Hero3+ or they just haven’t been created, yet. That’s what I’m putting together. I found the values from a friend, but I’d like to fill out that list so people not using CC have some reference. A Wikipedia.org page would be cool, too. I would but there are no presets in Pr for the Hero 4 Black, yet. I imagine they’ll turn up eventually, though. Hi, thanks for explaining this! I have a small predicament though, I took a lot of videos over the last 6 months and I’ve got no idea whether they were recorded in S, W, M, or sometimes even N. I’d love to go through and touch up some videos, but I can’t work out any way to look at the GoPro file and determine what mode it was recorded in. My only solution I can think of right now, is in future I’ll have to take a notepad or something and write down when I change FOV modes! Is there any way anyone knows of to retrospectively work out what FOV a GoPro video file was shot in? I’m not aware of a way to go back and determine what the field of view was. I double checked, and it doesn’t appear that any metadata or XMP info is stored within the file. However, I do know that if you put the wrong preset on a video, then it will be either over-corrected or under-corrected and you can tell from just looking at it. Usually it is pretty easy to tell b/c straight lines won’t be straight. The content will either still have fisheye distortion, or if over corrected, the fisheye distortion will be reversed. Concave lines will then appear convex instead of straight. The down side: this can require a little trial and error to find the right preset. Thanks for reaching out to us. I am sorry to hear about the confusion identifying Wide, Medium and Narrow videos. Unfortunately while the information is present on the file, it is not able to be accessed using Studio or any other player at this point in time. It sounds like you are able to tell visually which ones which. This would be the best course of action. I’m sorry I wasn’t able to help further. You guys are silly, the question should be why use these lenses in the first place if they DISTORT the physical world. You can get the 4.5 MM Rectilinear lens kit and that way no more CURVED WORLD and no need to edit anything. NASA uses these lenses as well so make the Earth Look more curved. These distortion lenses should be banned as they distort our world around us which with your own eyes you do not see anything curved. Even tv shows are not fixing the wide angle distortion and they put out the footage from parachute or sky jumps without fixing the footage so people actually think the physical work actually looks like that.